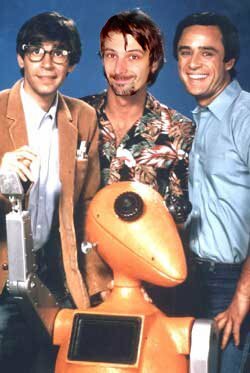 Riptide was a television series from 1984-1986 involving two Vietnam buddies who opened a detective agency in Los Angeles. It is classic 80s shtick now, but at the time it was pretty cool. 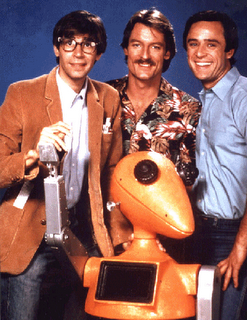 Cody Allen (Perry King) and Nick Ryder (Joe Penny) who ran the Riptide Detective Agency, recruited a "genius" who worked with computers, Murray 'Boz' Bozinsky (Thom Bray). Boz had a robot named Roboz. They also had a Sikorsky S-58T (aka, Sikorsky H-34 Choctaw) helicopter, painted pink with a huge gaping mouth painted on the front. It was called Screaming Mimi. I remember my brother loving this show (of course he also liked The Dukes of Hazzard and Charlie's Angels). I thought it was all right, but I was a more serious television watcher (Miami Vice, A-Team, and McGuyver). I thought of this show the other day with seemingly no reason to make the connection. I don't know why I thought of it; it just came to mind. I think television gets a bad rap. Now, I am a voracious reader, and my loyalty to literature should never be questioned, but it's easy for me to have a love for both television and books as I sleep less than most people. Granted, if given the choice between the annihilation of either, I would keep books near me and guard them forever. All that said, television still gets a bad rap. I think the problem is not watching television, it is the passive watching of television. I can come home from work exhausted, and believe me that is a possibility as a pastor, and just sit passively in front of the television passing the hours away and failing to use my imagination. But I don't. I cannot tell you the last time I passively watched television. When I watch I allow the show to engage me, making connections with television, films, literature. I watch critically, asking "Why did the writer choose that turn of phrase?" or "What a brilliant angle on that shot." James Burke, writer and creator of Connections understands the importance of linking things. Now, with all that said, there are only certain shows I watch. I am very picky. Sure all of this seems like the justification of a couch potato, but it's true nonetheless. Oh, yeah. I probably should mention that while Julia and I have a library that won't fit into one room, we only have a 13" television without cable. (Mmm, more justification.) So those of you who proudly bash television with your holier than thou attitudes, I say stop beating up on the poor thing. In ten years we'll look back at most of what we watch and remember Riptide. It was fun at the time, but now it's a bit dorky. Don't you think movies (particularly indie films would function better as a means of critical examination as opposed to television programs such as Riptide? Don't get me wrong, I sometimes watch TV (specifically "Myth Busters" and the Travel channel), but I would hardly critically analyze "A-Team," "McGuyver," or the like. Television programs, I think, mostly function as entertainment whose primary purpose is to pull our minds away from the "real world" whereas some movies beckon us, not to leave the world in which we live, but to reexamine it. For these reasons, I do think it's hard to underestimate the value of TV, but it would be an overstatement to label it as the Devil . . . maybe demon is a better word. Nevertheless, I still like to watch the old Teenage Mutant Ninja Turtles cartoons (without critically examining them) and wouldn't judge anybody else for doing the same. (Now Riptide, that's another matter.) I would argue that pop music, escapist literature, most television programs and movies, as well as vinegar-pickles all fall into the same category - virtually useless . . . far from sinful (except the pickles), but of little value. No, no, no, my new found friend. You must understand entertainment as gift. The true entertainer wishes to give to her audience an experience of transcendence. Real entertainment is gift. Real entertainment, at its purest level, gives without reciprocity. Your words betray you when you say "entertainment whose primary function is to pull our minds away from the 'real world'." As though entertainment, and not the entertainer, has some sort of an agenda. I will agree that some television entertainers wish to subvert true theology of gift. That is true not only of television, but film, and even books. But the heart of the true entertainer (read, perhaps, "Knight of Faith") wishes to give without thought of return. Look at Dickens. He was the Stephen King or John Grisham of his day. Yet now we look at Dickens as though there might be no greater Victorian author. He achieved the same international acclaim, unheard of in that time, as King or Grisham. Despite his "Pop"ular nature, we can still look at him critically. You know as well as I do that indie films are not the films they used to be. We're not talking about the *Pi* or *Iron Man* or even Johnny Depp's *Dead Man* of my college years. Indie now is considered anything with a budget under fifteen million dollars. C'mon, I listen to The Verge on XM radio. Indie isn't what it used to be. Television is the new playing field for critical thought. I mean, I'm a children's pastor and I've used the Simpson's in more sermons than I've ever used any film. Look at the CSIs and reconcile the idea of a conservative Gary Sinese existing in a particularly liberal tradition. Not to mention Horatio Caine's personal vendetta to avendge every abused child and marry every hot, young Miami girl in a bikini. There's something there to critique. Look at Captiain James Kirk's performances on Boston Legal. I think to suppose that television's main purpose is to "pull minds away from reality" is to miss the point of fiction entirely. With that attitude, television might as well be the new white flight out of the inner city. Indie films may look much safer for the critics, but that's because all their critical efforts moved out of the urban television setting. Check out *White Noise* by Don Delillo or *The Crying of Lot 49* by Thomas Pynchon. There's a sense there of a call to the critical of popular culture. Crap! Maybe I over-exaggerated a bit, so I'd like to retract parts of my previous statements. It's hard to admit when one's wrong . . . and it hurts. I will argue, however, that few "pop" forms of media (including literature, movies, television, music, etc.) actually critique American culture, values, mindset, etc. although there are some exceptions (i.e. the Simpsons). Most of the time, however, these forms of media merely reinforce it, and this is what I meant by calling these forms of entertainment virtually useless. I can see, though, that my generalizations and stereotypes were a bit overdrawn and overstated, and so, I apologize (although I still don't like Riptide). I wasn't arguing, however, that pop culture or media shouldn't be critically examined. I think it should be critically examined for the very reason that it gets our minds away from the "real world" by not critically examining the world in which we live - if anything it emphasizes all that is wrong with the world (i.e. your example of Horatio Caine). Pop culture and media, then, should be critiqued severely because it presents a pseudo-land of make-believe (the Matrix) instead of the Kingdom of God. One might find artistic value in these forms of media (for example, a brilliant camara angle shot), and that's great; I retract my previous statements rendering them valueless, but apart from their artistic value . . . there is very little real substance; I feel like I'm watching Nazi or American propaganda films when watching G.I. Joe or listening to Britney Spears. What do you think?